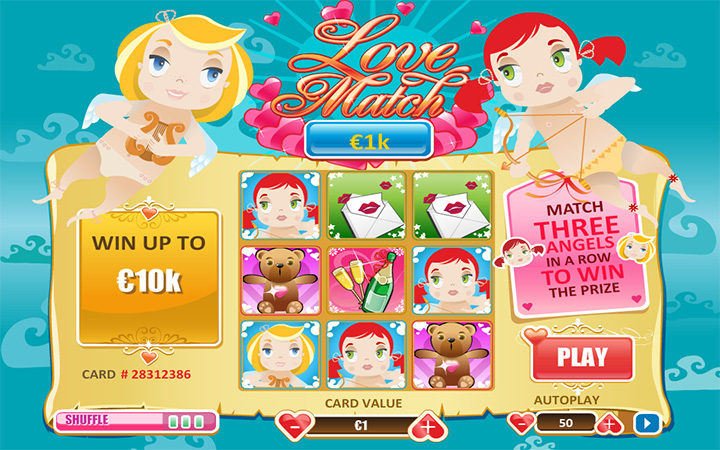 Love Match by Playtech is a classic scratch card game; which is also known as “instant lottery” games. As you already know, you get to “scratch” covered up sections of a lottery card and try to find three same symbols to get paid in these games. Online scratch card games follow the same formula, although there is a huge variety of themes. Love Match has a theme of “love” as you can guess by the name and two cupids accompany you through the game. The interface of the game is clear and easily understandable, although, there isn’t a paytable you can check. This confuses you a little at least in the beginning, because matching three symbols are not enough to win at Love Match. The game differs from the rest by the “match three symbols in a row” rule. Matching three symbols anywhere on the screen is enough to get paid in most of the scratch card games, but Love Match asks you to get these symbols in a row. In other words, getting three (or more) of the same symbols is not enough, they also must be placed in a row. You also need to match only one symbol: angels. The game has lots of symbols based on its theme, but only the angel symbols pay up. The payout of the game is based on how much you bet. You can bet between 0.50 and 20.00 coins per card. Betting 0.50 will make the maximum payout 5.000 coins. However, you can win up to 200.000 coins if you play with 20.00. You can also auto play up to 50 scratches if you want, just use the “autoplay” option located at the bottom right for this. After setting your bet, click on the “play” button to get your first cards. You can scratch each of the boxes or click on the “scratch all” button to reveal all. There is also a shuffle option too, but it is only available before scratching. (Which makes is pretty much useless.) Love Match is not your ordinary scratch card game; it pays well if you play with maximum bet values but also makes it harder to win because of its rules. Take a look to try something different, but it is hard to recommend this game to casual players. Play at Casino Avenue to find a game suited for your playstyle!